I’m so happy to come back to Sands Spit Island again. 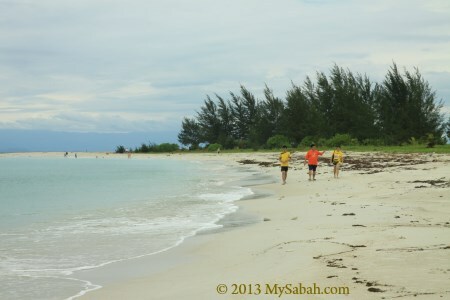 In my first visit, I said Sands Spit Island had one of the Most Beautiful Beaches of Sabah . After one year, I still say the same. 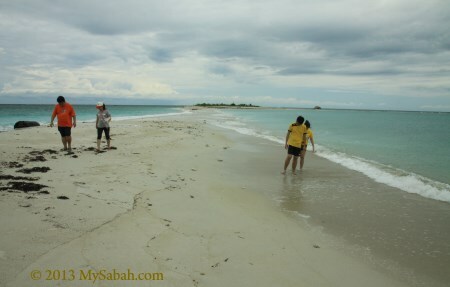 Sands Spit Island (Pulau Kalampunian Besar in Malay language) is a small island between Snake Island and Survivor Island of famous Pulau Tiga Islands Park. 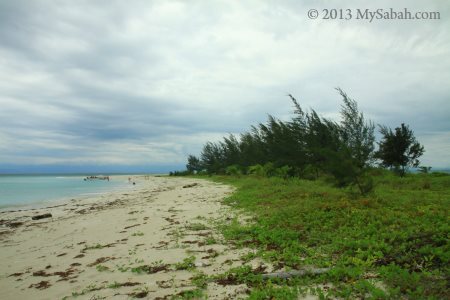 It was used to be a sand bar without any vegetation. 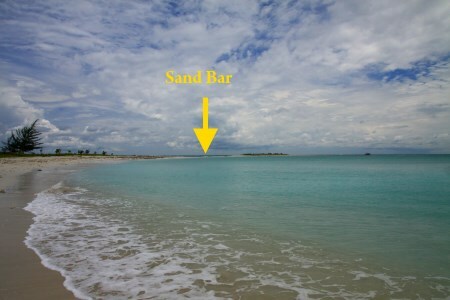 Today it has grown so big that nobody thinks it’s only a sand bar. 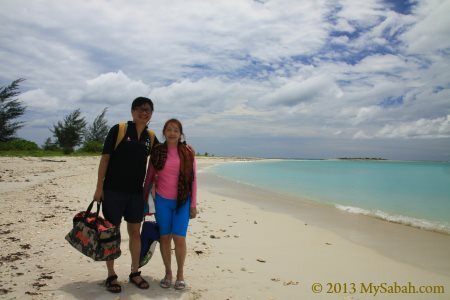 Pic: thanks to Edward and Candy (from Borneo Starcruise) for bringing me here. 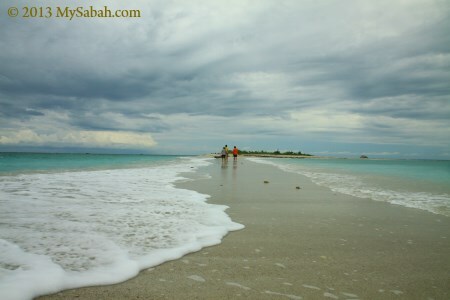 The long sandy beach of Sands Spit Island stretches over one Kilometer. 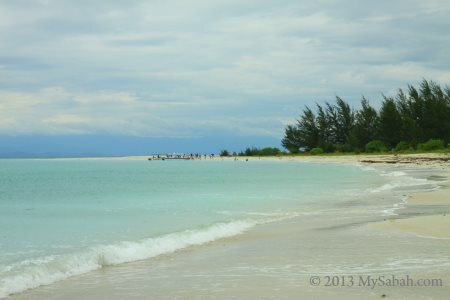 The beach is so pristine and nearly 100% paved by white sand, the dust of heaven. Some gives this island another nickname “Long Beach Island” (which is more marketable). 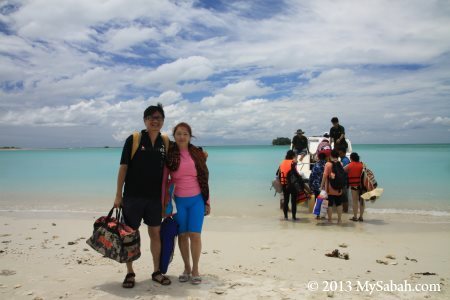 The water here is also crystal clear and shallow, very suitable for swimming and snorkeling. 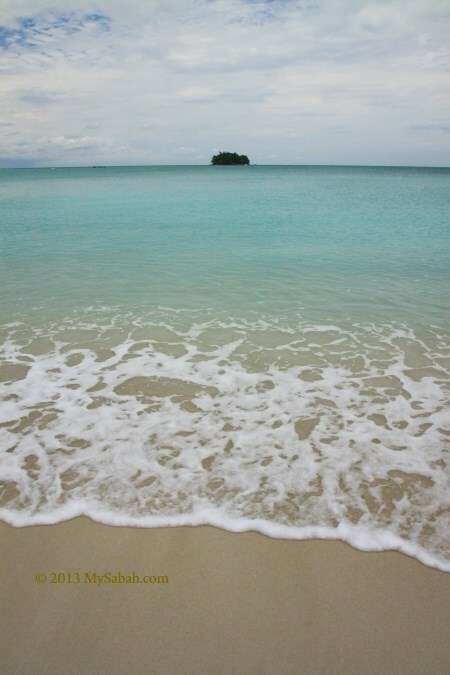 Sands Spit Island is isolated from civilization, so you are cut off from any interruption such as Internet. 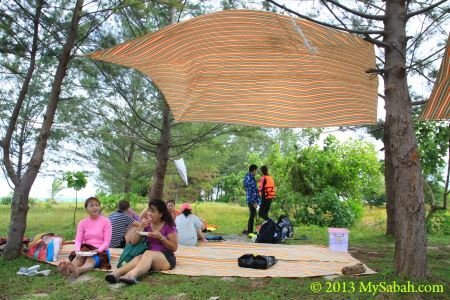 It is a great place for family to have a “pure” vacation, as parents won’t be “phubbed” by their children who are busy looking at their smartphone, LOL. 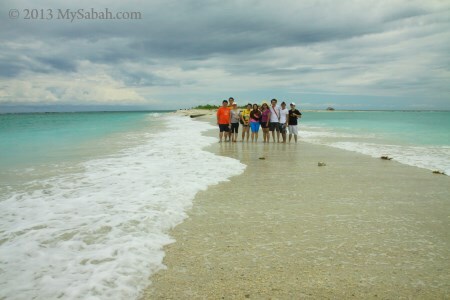 More and more travel agents know the beauty of Sands Spit Island and introduce it to their customers. 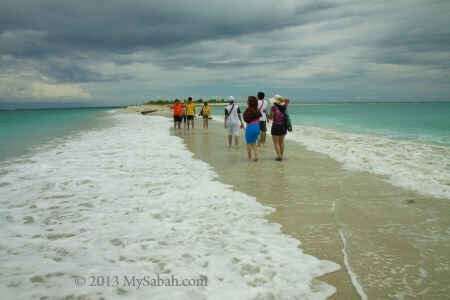 If you visit Pulau Tiga Island, you must drop by this island. In my second visit, I decided to explore the far end of the Sands Spit Island to see what’s there. There were a few busybodies joining me too. 🙂 There were some tiny sandflies around this area. Just stay nearer to the sea to avoid them. 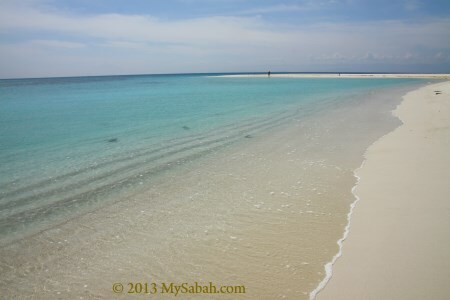 Pic: there is a narrow sand bar connecting to a small island far away. 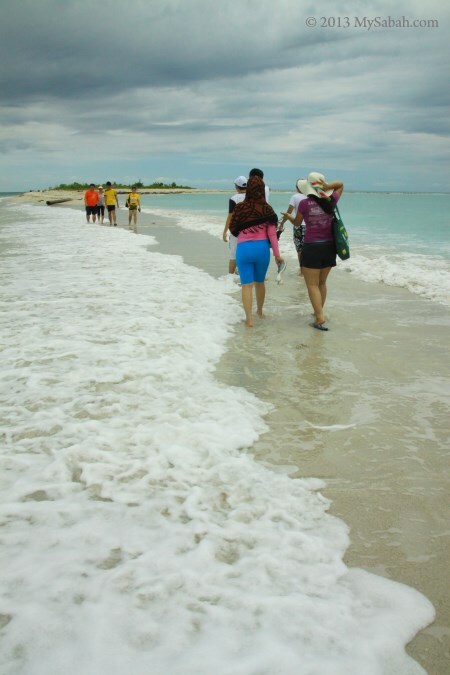 During low tide, you can walk over to another island. 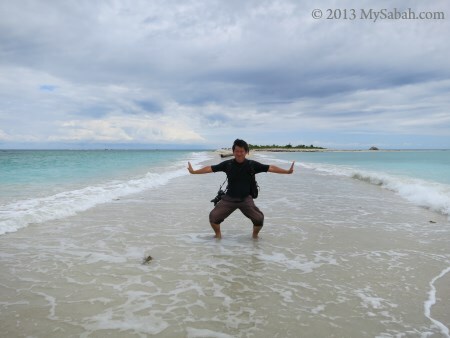 It’s kind of fun to stand in the middle where sea waves washing from both sides. Look mom! 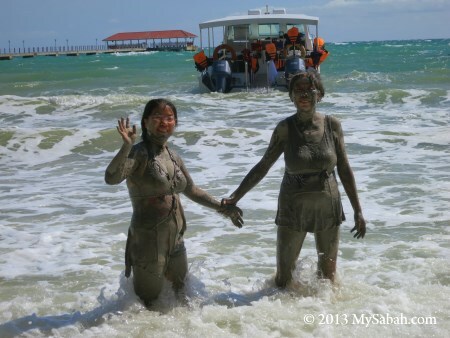 I can split the sea like Moses. Two families met and took a group photo. 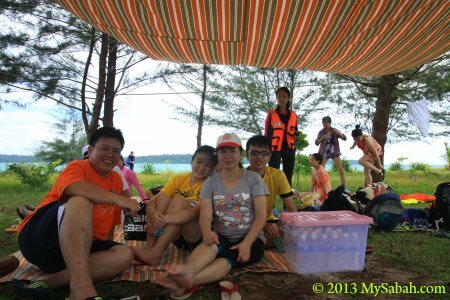 After swimming and walking, we rested under the shade of the trees. 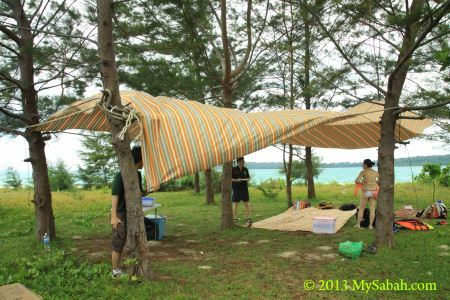 There is no man-made structure on this island, so Edward set up a canvas shelter and picnic area. We had our lunch (fried noodle, fried egg, curry chicken, meat dumpling) on the island. 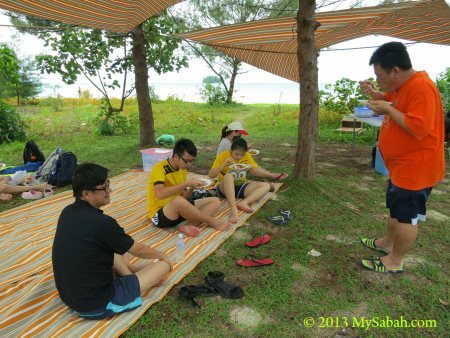 The food tasted so good after we had some activities. Tourists from other group even asked us if the food was for sale. 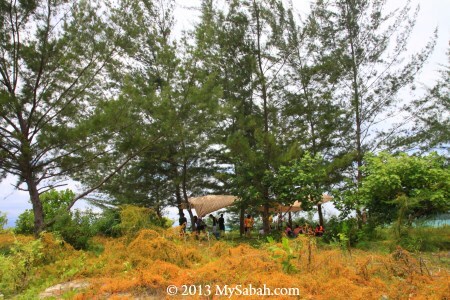 Pic: enjoying meal in sea breeze of Sands Spit Island. Everyone is happy. It just can’t get any better. 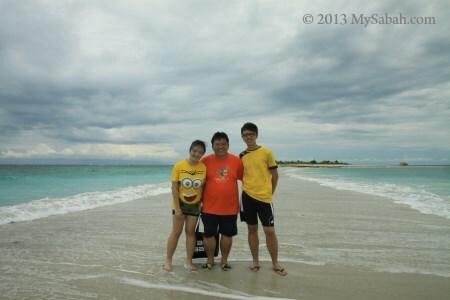 Too bad we had to leave at last, but we can always come back. The fun hasn’t ended yet. 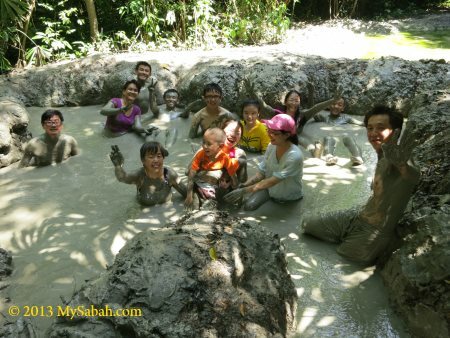 Edward brought us for a Mud Volcano SPA on Pulau Tiga Island (Survivor Island) nearby. 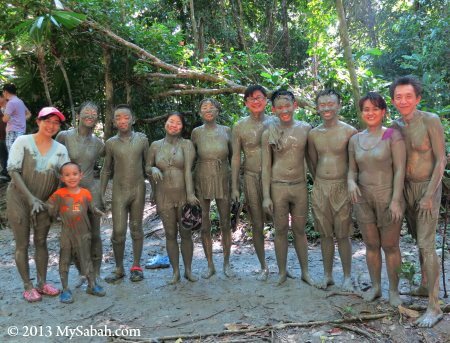 We got all dirty after the mud bath. 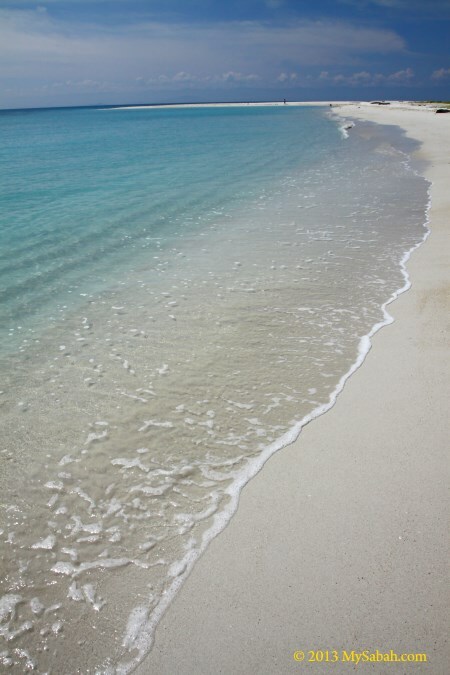 Now we had excuse to go to the beach again. 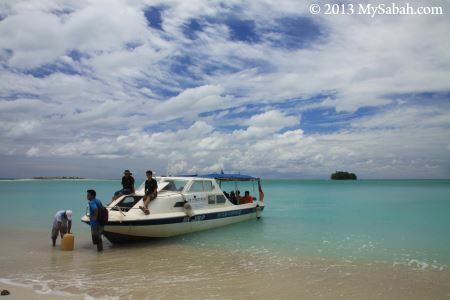 If you would like to have fun like us on Sands Spit Island, you may book a tour with Borneo Starcruise.